In a meeting with his leading generals and admirals on 3 February 1933 Hitler spoke of "conquest of Lebensraum in the East and its ruthless Germanisation" as his ultimate foreign policy objectives. In March 1933, the first major statement of German foreign policy aims appeared with the memo submitted to the German Cabinet by the State Secretary at the Auswärtiges Amt (Foreign Office), Prince Bernhard von Bülow (not to be confused with his more famous uncle, the former Chancellor Bernhard von Bülow), which advocated Anschluss with Austria, the restoration of the frontiers of 1914, the rejection of the Part V of Versailles, the return of the former German colonies in Africa, and a German zone of influence in Eastern Europe as goals for the future. Hitler found the goals in Bülow's memo to be too modest. In March 1933, to resolve the deadlock between the French demand for sécurité (“security”) and the German demand for gleichberechtigung (“equality of armaments”) at the World Disarmament Conference in Geneva, Switzerland, the British Prime Minister Ramsay MacDonald presented the compromise “MacDonald Plan”. Hitler endorsed the “MacDonald Plan”, correctly guessing that nothing would come of it, and that in the interval he could win some goodwill in London by making his government appear moderate, and the French obstinate. In May 1933, Hitler met with Herbert von Dirksen, the German Ambassador in Moscow. Dirksen advised the Führer that he was allowing relations with the Soviet Union to deteriorate to a unacceptable extent, and advised to take immediate steps to repair relations with the Soviets. Much to Dirksen's intense disappointment, Hitler informed that he wished for an anti-Soviet understanding with Poland, which Dirksen protested implied recognition of the German-Polish border, leading Hitler to state he was after much greater things than merely overturning the Treaty of Versailles. 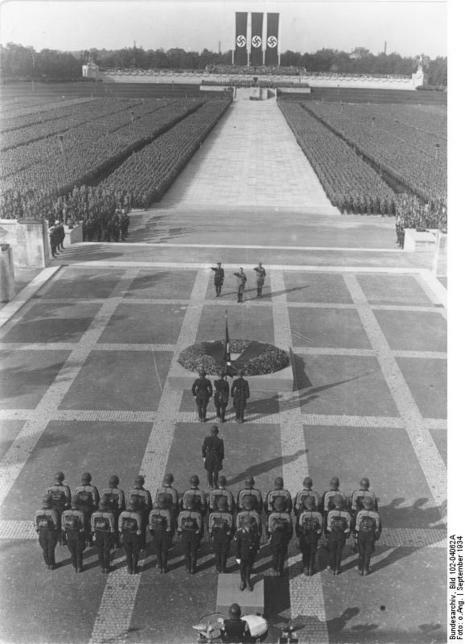 Hitler ordered the army to be trebled in size, from the 100,000 man Versailles Treaty limit, to 300,000 men by October of 1934. This was initially ordered to be carried out under the utmost secrecy. Admiral Raeder, the chief of the navy, was given orders to begin the construction of large warships, way above the maximum size decreed by the Versailles Treaty. The construction of submarines, also forbidden by the Treaty, had already begun secretly by building parts in foreign dockyards ready for assembly. In addition, Goering had also been tasked by Hitler with the training of air force pilots and the design of military aircraft. In March 1935 Hitler decided to take a gamble and test the resolve of Britain and France by authorising Goering to reveal to a British official the existence of the Luftwaffe (German Air Force). Even though this was a direct challenge to the Versailles Treaty, there was little reaction (its existence was already known anyway). Thus Hitler was given encouragement to take further steps. A few days later, Hitler took a further gamble and declared openly the introduction of military service and the creation of an army with 36 divisions (approx. 1/2 million men). Again, a weak reaction from Britain and France allowed Hitler the comfort of knowing that his gamble had paid off. At the same time that Hitler was increasing the strength of the armed forces, he was also following a policy of making speeches proclaiming a desire for peace and the folly of war. He also announced that he had no intention of annexing Austria or re-militarising the Rhineland and would respect all the territorial clauses of the Versailles Treaty. Hitler also announced that he was prepared to mutually disarm the heaviest of weapons and limit the strength of the German Navy. A quote from Hitler at that time: "Whoever lights the torch of war in Europe can wish for nothing but chaos."